Cut the salmon into thin scallops (1/3 inch). Grease a baking sheet and place the salmon in one layer, not touching, on sheet. Combine the creme fraiche and mustard in a small bowl and coat salmon with mixture. For the sauce, sweat the garlic and shallots in oil in a small pot. Add the tomato concasse and wine and cook over medium-high heat for about 10 minutes, stirring regularly. Season with salt, pepper, and thyme. Bake the salmon until cooked through (about 10-15 minutes). Place sauce on each plate and lay Salmon fillets over the sauce. Garnish with lemon and thyme. This looks great! I’m always looking for new ways to serve salmon. What were your side dishes? SImple garlic mashed potoatoes an asparagus. I wouldn’t suggest asparagus at this time of year, but broccoli would work too. I love finding new salmon recipes as well. Be sure to connect with me on Twitter (http://twitter.com/#!/jennymo57) and let me know if you have any great ones as well! Hey I just stumbled on to your blog and I just wanted to say it’s fantastic! All your recipes look super delicious, especially this one. I’ll have to try it some time! Well I look forward to more of your recipes! First congrats on getting into top 9 and being featured in Foodbuzz! 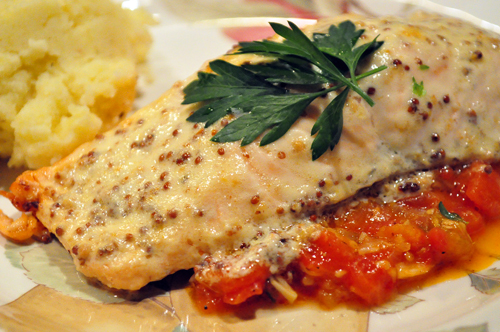 I love salmon and am glad to have another new recipe to work on, coz yours so inviting! Thanks for adding me as one of your Foodbuzz foodie too. That’s definitely one delicious meal! I love the fillets and I especially like that sauce – beautiful job! Oh that sounds and definitely looks amazing!!! Yummy! Wow this looks so healthy and delicious! Love that tomato coulis too! Looks delicious! This is dinner! This looks totally awesome, I might have to try it this weekend. Thanks for adding me on tumblr, and checking out my site too. Yours is GREAT.